In this work, we report the synthesis of novel magnetic molecularly imprinted polymers (m-MIPs) and their application to the selective extraction of the mycotoxin citrinin (CIT) from food samples. The polymers were prepared by surface imprinting of Fe3O4 nanoparticles, using 2-naphtholic acid (2-NA) as template molecule, N-3,5-bis(trifluoromethyl)phenyl-N'-4-vinylphenyl urea and methacrylamide as functional monomers and ethyleneglycol dimethacrylate as cross-linker. The resulting material was characterized by transmission electron microscopy (TEM), and X-ray diffraction (XRD) and Fourier transform infrared spectroscopies (FT-IR). The polymers were used to develop a solid-phase extraction method (m-MISPE) for the selective recovery of CIT from rice extracts prior to its determination by HPLC with UV diode array detection. The method involves ultrasound-assisted extraction of the mycotoxin from rice samples with (7:3, v/v) methanol/water, followed by sample cleanup and preconcentration with m-MIP. The extraction (washing and elution) conditions were optimized and their optimal values found to provide CIT recoveries of 94–98 % with relative standard deviations (RSD) less than 3.4 % (n = 3) for preconcentrated sample extracts (5 mL) fortified with the analyte at concentrations over the range 25–100 μg kg−1. Based on the results, the application of the m-MIPs facilitates the accurate and efficient determination of CIT in rice extracts. 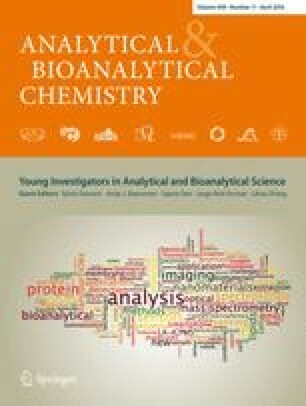 Published in the topical collection featuring Young Investigators in Analytical and Bioanalytical Science with guest editors S. Daunert, A. Baeumner, S. Deo, J. Ruiz Encinar and L. Zhang. Javier L. Urraca and José F. Huertas-Pérez contributed equally to this work. The online version of this article (doi: 10.1007/s00216-016-9348-8) contains supplementary material, which is available to authorized users. This work has been supported by MINECO (CTQ2012-37573-C02-02). J.L. Urraca thanks the CEI-Moncloa for a post-doctoral contract. J Gracia-Mora thanks PASPA-UNAM and CONACyT for a grant for his sabbatical leave. http://ec.europa.eu/food/food/chemicalsafety/contaminants/docs/monitoring_recommandations_en.pdf. Accessed 3 November 2015.